Koso Setagaya uses only rice bran for the enzyme bath, where various natural chemical reactions occur. The benefits of enzyme activities are maximized by using 100% rice bran unlike other types of enzyme baths which use sawdust or cypress wood shavings. 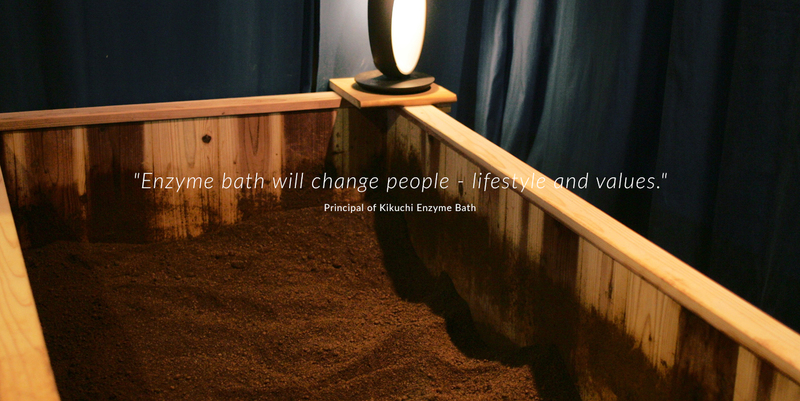 The rice bran enzyme bath offers the best texture and produces sustainable heat. In the old days, rice bran was used as a natural soap and a tranquilizer, and is rich in vitamins and minerals. 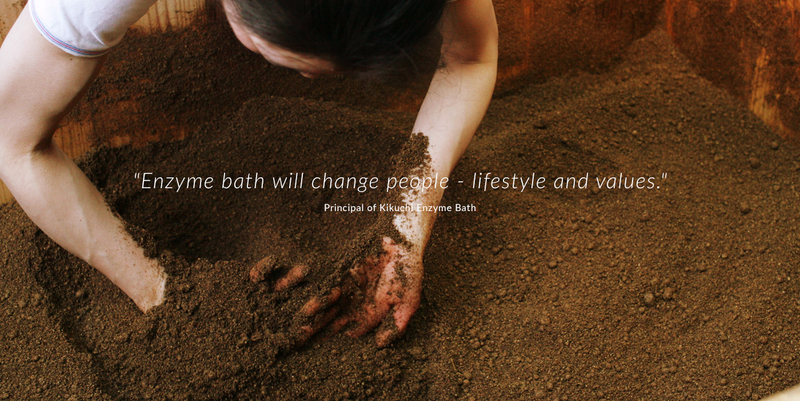 Rice bran enzyme baths create the best environment to maximize the benefits of enzyme baths. The enzyme bath heat is generated through fermentation. This fermentation process in our baths is done naturally without any help of additional bacteria. The heat is created only by the original bacteria in rice bran. It takes about two hours to take care of the rice bran in each tub every day. It is important to spend time and provide tender loving care to create a the best condition in the tubs. Enzyme is "a limited resource" in every living creature. Without enzymes, we can't digest food or move our bodies. Many of us suffer from an enzyme deficiency. Enzymes penetrate into your body through your open pores and activate the cells of your body, which slows aging, strengthens the immune system and improves natural self-healing. This will lead to the recovery of many of your health issues. Enzyme temperatures rise to 60C-70C in an all-natural process. Rice bran has a soft and fluffy texture and the enzyme bath is completely unlike a sauna. It is a similar experience to a sand bath. Many people feel comfortable enveloped in the rice bran and fall asleep. Just 15 minutes soaking in the radiant heat of an enzyme bath warms up your body internally. After perspiring in the bath and enhancing metabolic processes, you will be surprised to feel your smooth skin when you wash off in the shower. The enzyme bath helps you with health issues, improves your skin, aids in weight loss and slows aging. Please come and enjoy the ultimate relaxation. You can extend the bathing time (we will try to accommodate your request but in some cases it may not be possible). We welcome customers with children. The enzyme bath stimulates brain activities in children. We also have some toys and books for children who wish to wait in the waiting room. The rice bran waste is a good fertilizer. It is complimentary, and is very popular among farmers. Please let us know if you are interested. We only rely on the natural heat from the rice bran. 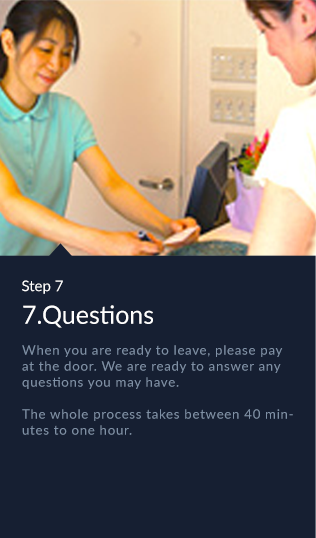 Depending on circumstances such as the weather, humidity, and number of customers, the bath temperature may vary. If you prefer a hot bath, please be sure to book an appointment earlier in the day. Growing up, I was frail and often got sick. Because of that, there were many things I wasn't allowed to do. It got worse after I gave birth to my daughter. Then I learned about enzyme bath. It made me feel so much better and I became devoted to it. I wanted to bath in rice bran enzyme every day, and to share the experience with my mother and one-year old daughter. 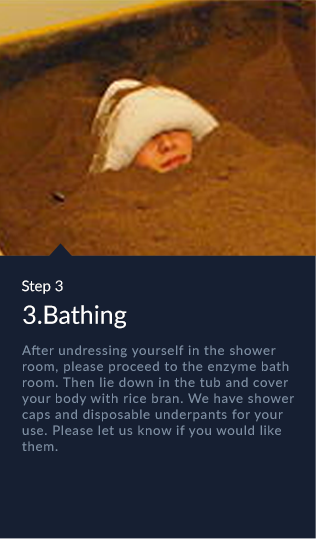 As a result, I decided to open my own enzyme bath spa. My body condition has improved dramatically and eight years later I was able to have another child. Every day I spend about two hours taking care of rice bran in each tub to create good enzymes. I add some water to the rice bran and mix it with my own hands. The tubs are pretty low so it is good exercise for me! "Enzyme bath will change your mindset and your life"
People lose confidence when they are sick. I felt that way when I wasn't well. Illness sometimes causes problems in people's relationships with others. Illness causes problems within families. Physical health brings mental health. After gaining health, some of my customers try new things they had given up when they were sick. Your relationship with your family improves. Some people search for reasons fro explain why they got sick. Enzyme bath brings you physical health along with mental health and beauty. This eventually leads to an increase in the number of happy people. It isn't an easy job. But it is my strong belief that people can do anything as long as they are healthy. 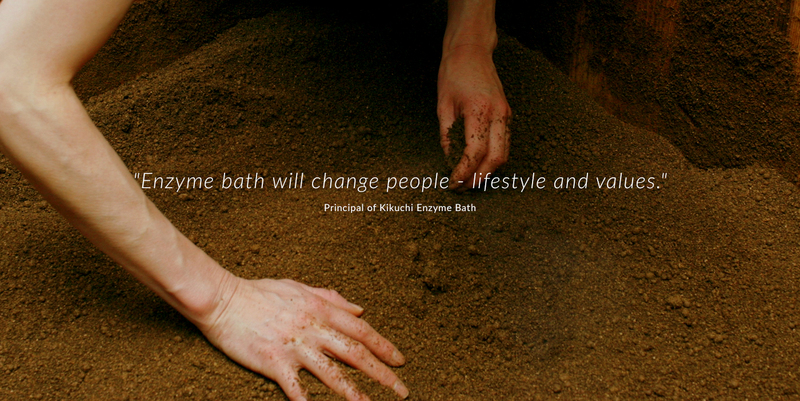 Some of my clients have opened up their own enzyme bath spas after recovering from their illnesses and are now sharing the power of enzymes to heal more people. For me, the reward is looking at the happy faces of my clients. I am a judo athlete and also coach judo. I fell on my neck and injured myself. After that, I wasn't able to use my right shoulder well. I couldn't make a fist. I went to many hospitals and visited chiropractors numerous times but my condition wasn't improving and I felt very impatient. 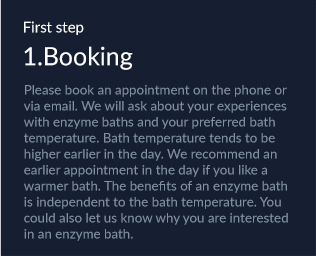 I happened to learn about enzyme bath on the internet and decided to give a try. After a repeat visit, I was able to feel strength in my right shoulder again. I kept visiting the enzyme bath after my practices. Now I am participating in competitions. Whenever my friends injure themselves, I always suggest them to go to enzyme bath treatment. I learned about enzyme bath after we moved to the area. My husband and I were going through an infertility treatment at the time. In addition to the medical treatment, I tried different natural therapies such as pelvic correction, steamed mugwort therapy and germanium hot bath. But we weren't successful. I decided to try enzyme bath. After my second visit, I realized that rashes on my back had disappeared and my body felt very warm. I thought this might work and kept visiting the enzyme bath. I was finally able to get pregnant. After giving birth, I was busy with a newborn and didn't get to go to the enzyme bath for a while. Unfortunately a cyst developed in my ovary. As treatment, I started enzyme bath again. It keeps my body warm which is good for infertility treatment and relaxes me. It is very convenient that my child can lay next to me. When she doesn't want to go into the bath, Kikuchi-san babysits for me. In my late 60's, I developed rheumatism. I felt very depressed. It got worse to the extent I could no longer get up on my own. I moved in with my daughter in Setagaya. I used to visit her spa every time I visited my daughter and knew Kikuchi-san very well. I visited the spa every day for two months. At first the pain in my knees was so bad that I couldn't lie down or get up from the bathtub by myself. Kikuchi-san got into the tub to assist me and accompanied me to the shower room each time. I developed a strong trust in her and kept visiting the spa. Now I can take the train to the spa by myself. Being in a rice bran bath really relaxes me. Japanese rice bran enzyme will give you energy and revitalize you. The treatment will enhance your natural healing and lead you to a healthy body and a sound heart. It's not overpowering. You can sense the Japanese subtle approach in this treatment. Japan is a fermentation "super power." People in Japan have always recognized the value of rice bran enzymes and used rice bran which otherwise would have been thrown away. You can join us to let the world know about the benefit of rice enzyme bath. We were recognized for our special techniques in rice enzyme bath, its procedures and other holistic treatments. We have trademarked our enzyme bath experience and have developed a special training course to be a rice enzyme bath therapist. After completing our training course, you can use our "Koso labo" logo at your spas. It certifies your knowledge and proficiency in the techniques of enzyme bath. People with agricultural experience or with a knowledge of nature, who are familiar with enzyme functions, are ideal candidate to become therapists. To spread the benefit of enzyme bath to make people happy, please support enzyme bath. 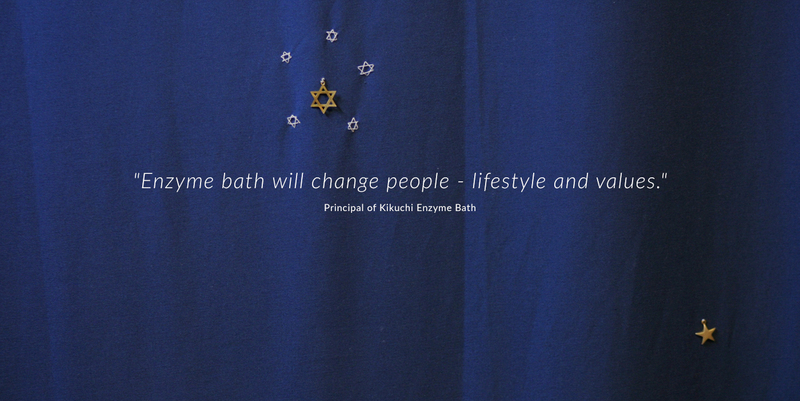 "Enzyme bath will change people - lifestyle and values." 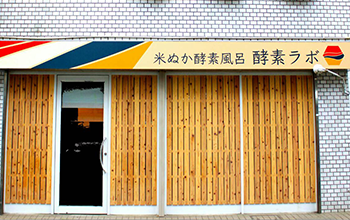 For appointments in English, please email at kousolabo@wine.ocn.ne.jp . As we don't have an English speaking staff, please understand that ßit may take a few days to contact you. If you don't hear from us for a few days after contacting us, please double-check your junk mail folder. Our response might be in your junk mail folder. There is one parking space. Please reserve in advance. 13 minutes walk from Soshigaya Okura Station on Odaku Line. A bus departs from Soshigaya Okura Station. Please get off at Tsukato Minami and walk back a little. The bus departs the station twice an hour, on the hour and half hour. © Copyright Principal of Kouso Labo. All Rights Reserved.